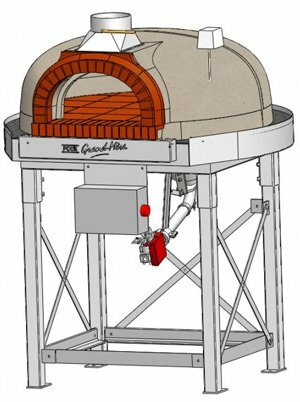 F950BG – the smallest all chamotte gas/wood oven. Tile hearth and brick arch. 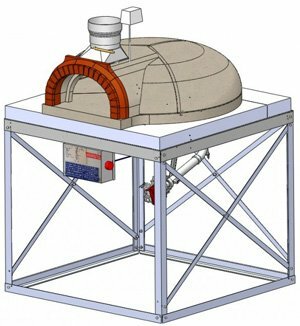 With equipment-includes the oven, insulation, flue connector, cast iron door, steel table, gas burner, digital thermometer. 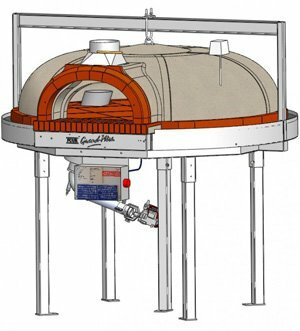 F1030BG – all chamotte gas/wood oven. F1200BG – chamotte as standard but available in brick as extra. Bakers tile hearth and brick arch. Variation: 1200LG all chamotte oven with no external steel frame. Available with two entry arches at 180°, one with a glass cold wall so customers can see the flames. F1400BG – chamotte as standard but available in brick as extra. Variation: as 1200BG- also available with rotating hearth or rotating plates.